Very easy to set up but might display choppy animations. 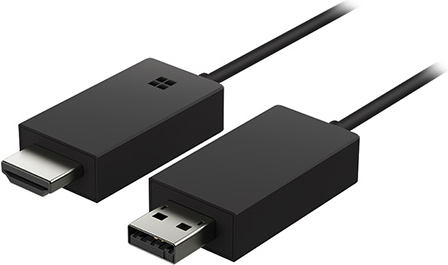 The Microsoft Wireless Display Adapter is a small HDMI dongle that is powered through a USB port on your TV (no power adapter included). It works through WiFi direct, which means there is no setup procedure required at all: just plug it into your TV and you can immediately select it as a casting target in Microsoft Windows 8.1 or Windows 10 through the action center. This article lists all the necessary steps in detail. Since this adapter establishes a direct connection over WiFi with your screen, it is recommended that your casting computer stays within a distance of 10 meters from the display to achieve a stable connection! It can also be casted to through the Miracast protocol from some (but not all!) Android smartphones/tablets, always given that your smartphone manufacturer supports Miracast (please check the technical specifications of your device). A connection to Apple iOS/macOS devices is not possible as they use Apple's AirPlay protocol, which this adapter does not support. Pros: no setup process required at all, it's really plug and play as long as your are using a Windows PC! Cons: picture quality is satisfying, however it is limited to 30 Hz in full HD resolution, resulting in choppy animations when new content comes in to your wall or if you use a Walls.io theme with a lot of animations like our Kiosk theme.